The renowned ATV Adonnis, the LSG stud who has collected 14 banners and other assorted awards, including some impressive Get of Sire honors. 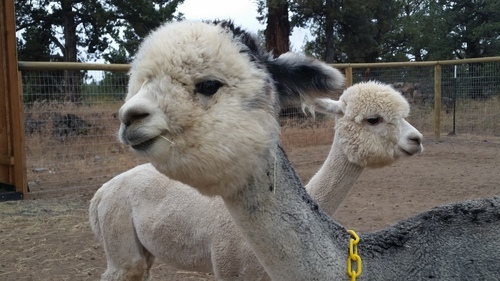 More importantly, Adonnis has made an indelible mark on the alpaca world, leaving behind alpacas of distinction, especially in the grey color group. With great sadness we announce the death of ATV Adonnis on March 30, 2015. He will be missed but remembered with his amazing offspring. Fortunately, his genetics live on. Evening Mist is the daughter of Sillueta by Nitro, a true black 4X champion. 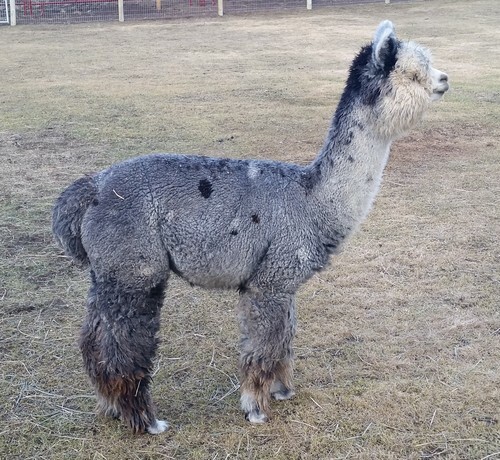 Her pedigree includes double doses of Legacy on the top side and multiple doses of gray genetics throughout, including Mr. Roosevelt, on the bottom side. 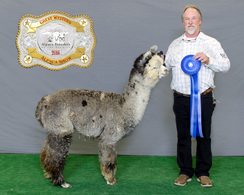 You know at a glance that Evening Mist is from good stock, because her rich dark-brown fleece first catches your eye and then you notice her pleasing phenotype. The more you look, the more you like. Her 18.9-micron fleece is not only fine, but also dense and luxurious. As an added bonus, Evening Mist was bred to ATV Adonnis for excellent density and architecture. 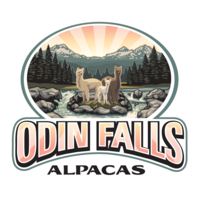 Odin' Evening Adonnis, another genetic power-house. 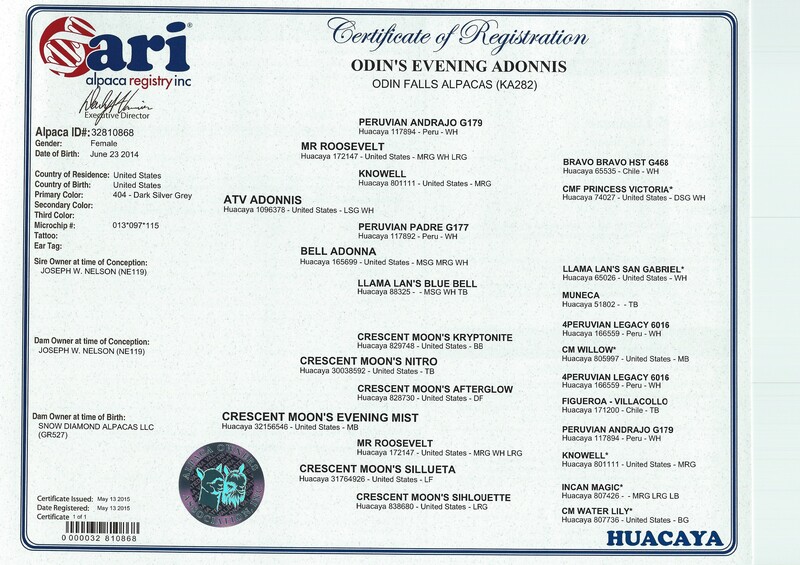 Let's look at her Sire, the renowned ATV Adonnis. This incredible Sire is no longer with us, he died March 30, 2015. 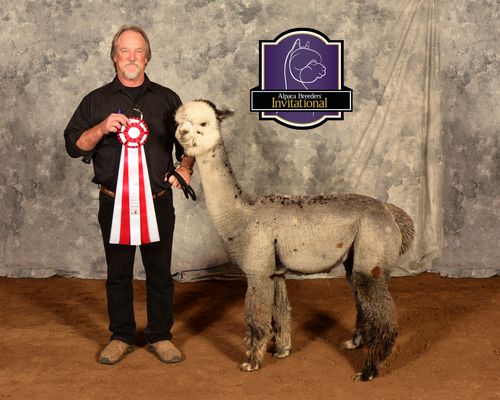 He will be missed by many with an impressive show record of 14 Banners along with some impressive Get of Sire honers. Then we have her Dam, Crescent Moon's Evening Mist. She is the Daughter of the 4X Champion True Black, Crescent Moon's Nitro. 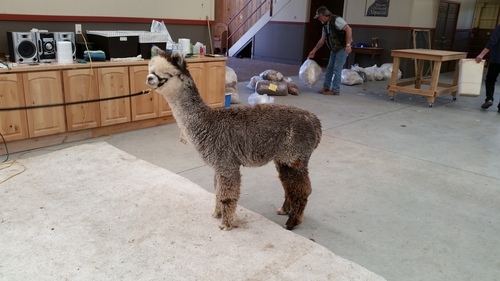 We have other Nitro cria on our farm, unbelievable genetics. Adonnis's first Histogram report came in at 18.2 microns. Not bad for a little Gray girl. We are debating who we will use for her first breeding next spring, could be Ausable Valley's Ascent. Could be amazing.